K. Lumsy's Prison, as seen in Donkey Kong 64. 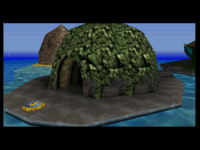 K. Lumsy's Prison, or K. Lumsy's Island, is a small, round island that the giant Kremling K. Lumsy is trapped in for most of Donkey Kong 64. The interior is much larger than the exterior but is mostly empty except for the cage holding the Kremling, although the area does contain two Golden Bananas. Both of them can only be obtained by Lanky Kong, the first outside the prison with his Grape Shooter and the second inside using his OrangStand Sprint. K. Lumsy's Prison is later seen in the ending, after Funky Kong launches K. Rool out of the damaged King Kruiser II and into the prison. While not actually shown on screen, it is implied K. Lumsy beats him up in retaliation for being locked up. ↑ The Donkey Kong 64 Player's Guide foldout. ↑ Barton, Jeff, Mario De Govia, and Donato Tica. Donkey Kong 64 Prima Official Game Guide. Page 14. This page was last edited on September 22, 2018, at 05:24.